Hi there, my darlings! Happy Friday! After 2 days of gloom and rain, the sun is finally out AND it's the weekend, baby! As you can see, I'm in a GOOD mood and raring to go! 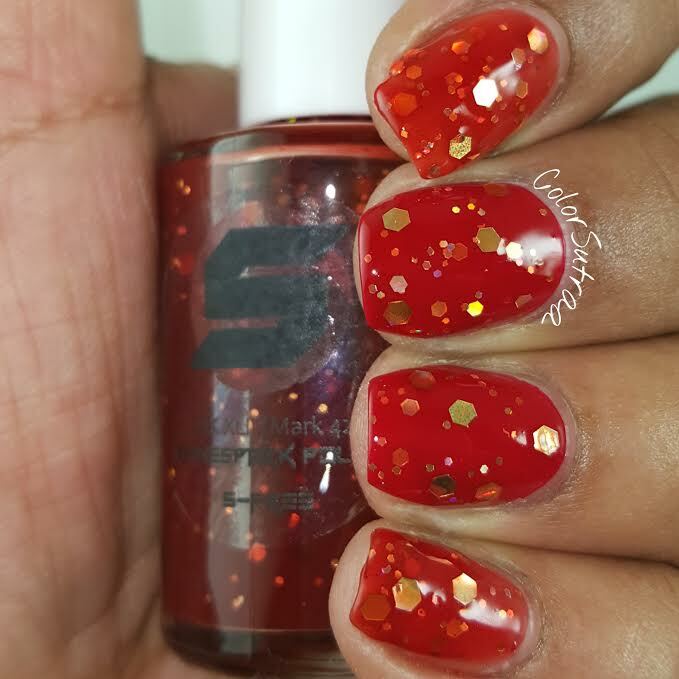 Let's start the day off right with a selection of goodies from Molly of Shinespark Polish, including her picks for the Maker's Faves of 2015 Giveaway. 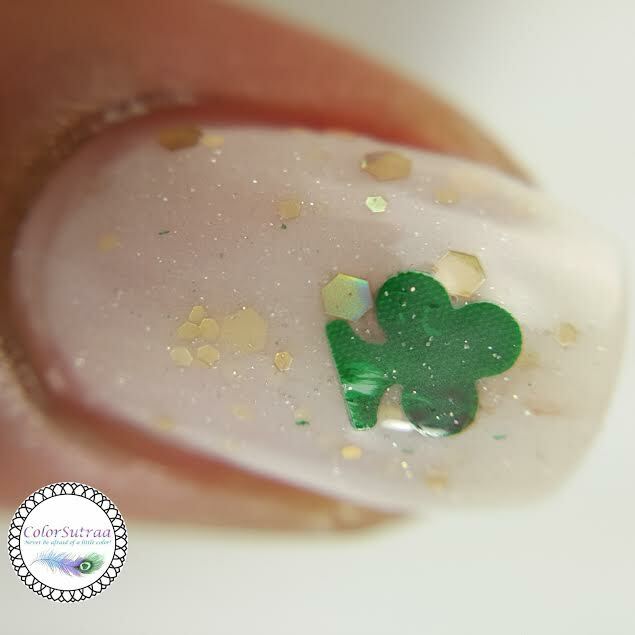 Luck O' the Irish is described as a "white crelly with emerald green matte and holo shamrocks, gold holo hexes and silver holo microglitter." 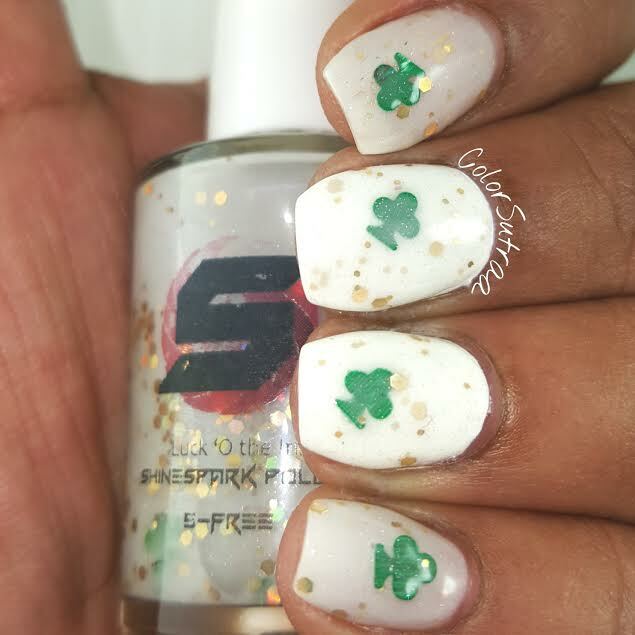 Formula of the crelly itself was just fine but I did have a heck of a time getting those shamrocks out of my bottle--they are fairly large glitters and tend to sink very quickly to the bottom. 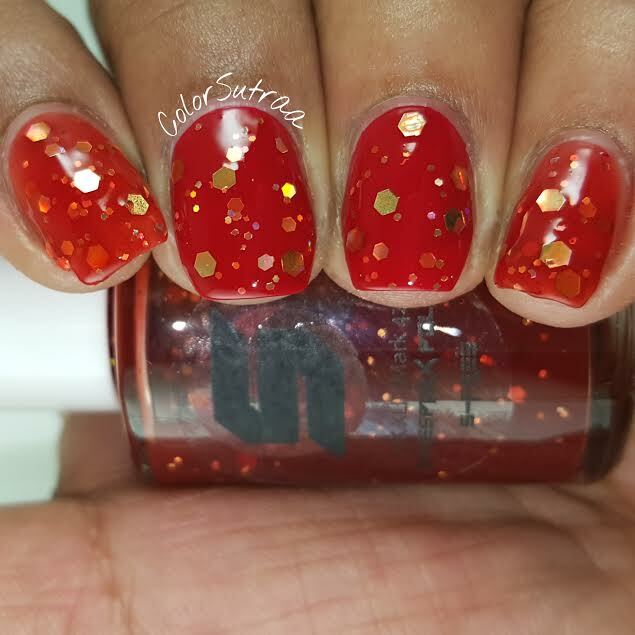 I had to fish out and place those glitters you see in the pics below. 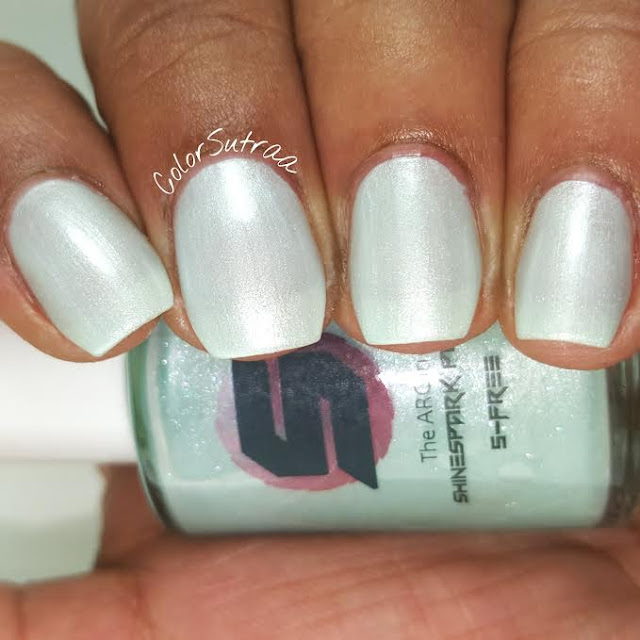 The swatches below show 3 coats by itself on the index and pinkie fingers and 2 thin coats over Sally Hansen OMGhost on the middle and ring fingers, all topped with 1 generous coat of Glisten & Glow's HK Girl topcoat to bring it all together. 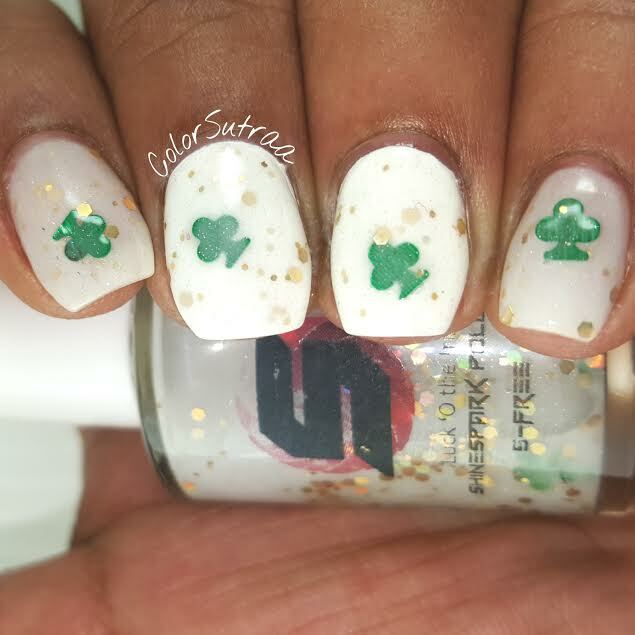 Not gonna lie here, I did have to spend quite a bit of time fishing for those shamrocks but they are adorable on the nail! 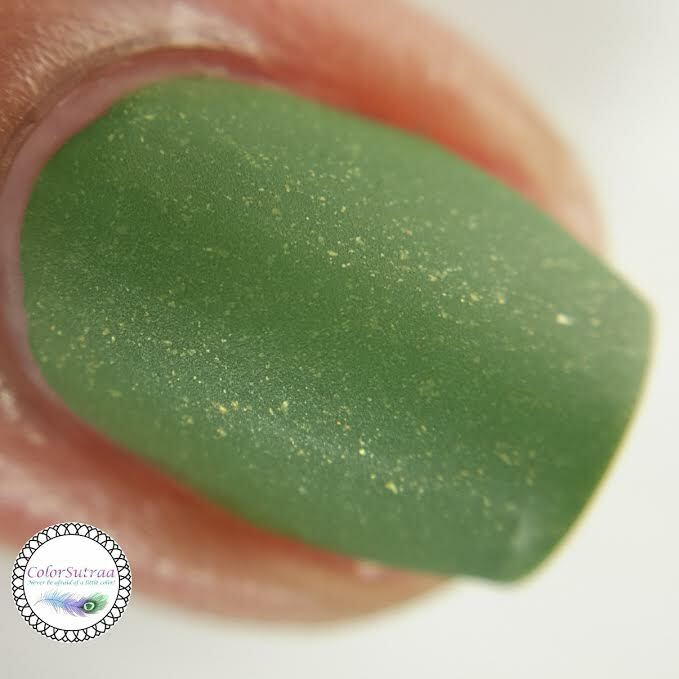 Emerald Isle is a rich green creme packed with a ton of gold microflakies. Now this was described as a one-coater but you know how you get those one-coaters and they actually turn out to be one-and-a-half-coaters? Well, not this baby! 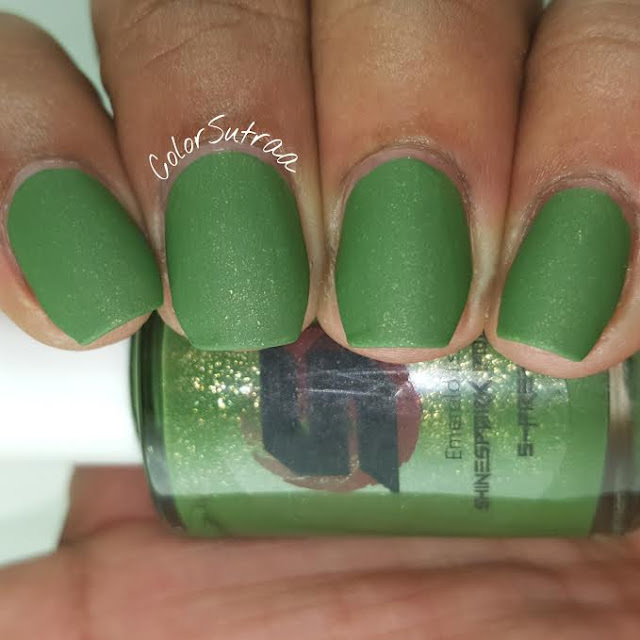 This is a true ONE-COATER and the formula is divine! 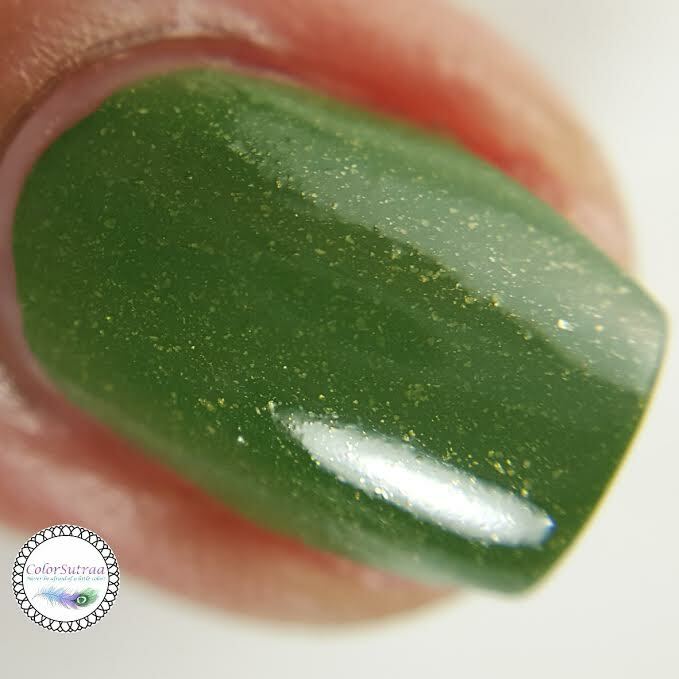 Plus it's thick enough that it smoothly covers all the little ridges in my nails for a perfect finish. 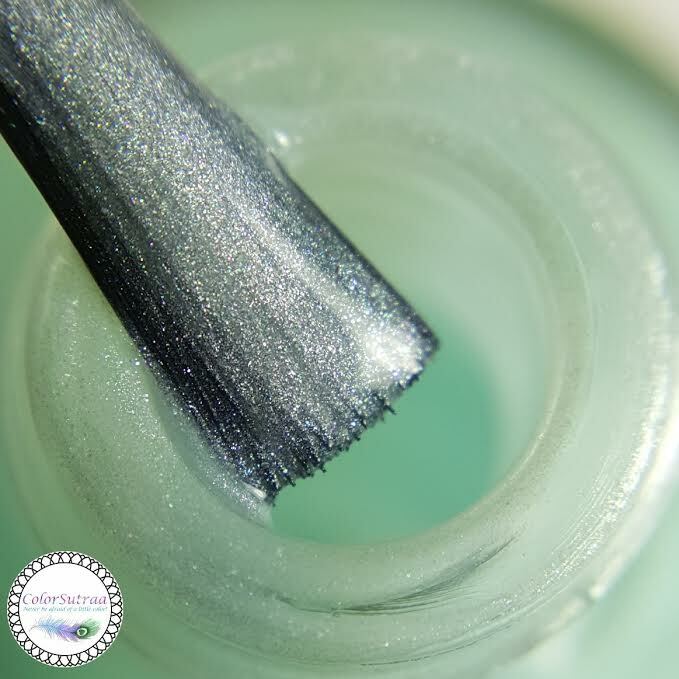 The swatches below show just 1 coat, topped with 1 thin coat of Glisten & Glow's HK Girl topcoat. Such a perfect green! Now, I have to admit I had no idea that Molly also makes bath & body products so I was really surprised that my package smelled so GOOD! Upon opening it up, I see that she'd included samples of three of the products she currently makes : a Goat's Milk Soap bar, a Bath Bomb in Dreamsicle and a Lip Balm in Creme de Menthe. 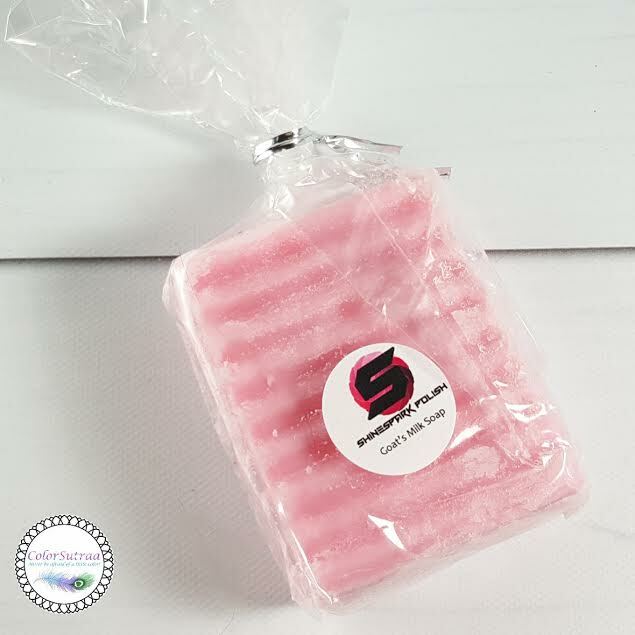 Handmade Goat's Milk Soap Bars : This 100% handmade goat's milk soap is amazing! 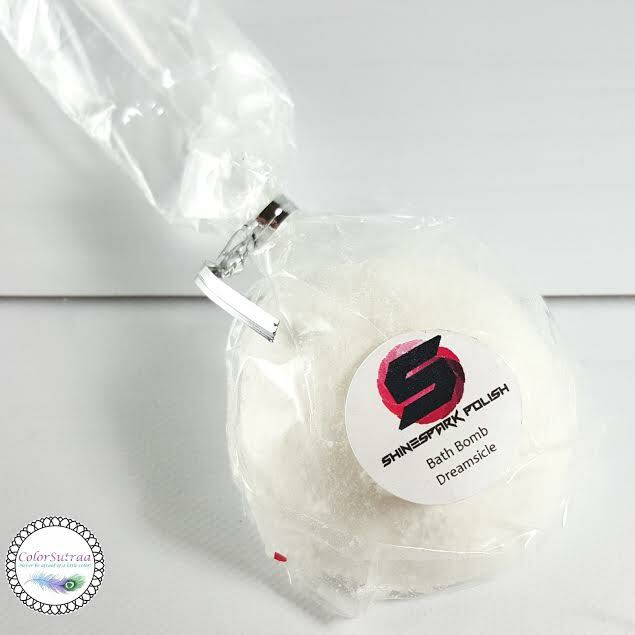 Super luxurious without the super expensive price tag, once you try it, you'll never want to use regular soap again! Incredibly rich lathering, with goat's milk and grapeseed oil to help nourish your skin. Available in 7 scents : Dreamsicle, Candy Cane, Sinus Relief, Rose Graden, Chocolate Mint, Berry Wine and Tea Tree. IMPRESSIONS : I haven't had a chance to extensively try this but I did test out a sliver of it out and I really love how good it smelled and and moisturized my hands felt after using it. These all natural soap bars are really great for your skin, especially during winter! IMPRESSIONS : Having a full-time job and a full-time blog, it's rare that I get a chance to take a bath. But I DO love to indulge in foot soaks and GOD! This was perfect! I only needed to break off a chunk to get a fully lathered foot soak and my feet felt so much better, no just moisturized but less achy and tired! I received the Dreamsicle scent and loved it--I HAVE to try Berry Wine! Beeswax based lip balm : Our beeswax based lip balm is A-MAZ-ING! It is super soft and glides on smoothly, and a little goes a LONG way. Contains only six ingredients: coconut oil, beeswax, sweet almond oil, avocado oil, sucralose, and flavoring. Our lip balms are a SOFT lip balm, and will be of a very soft consistency whether in tube or pot form. They are lightly flavored/scented. 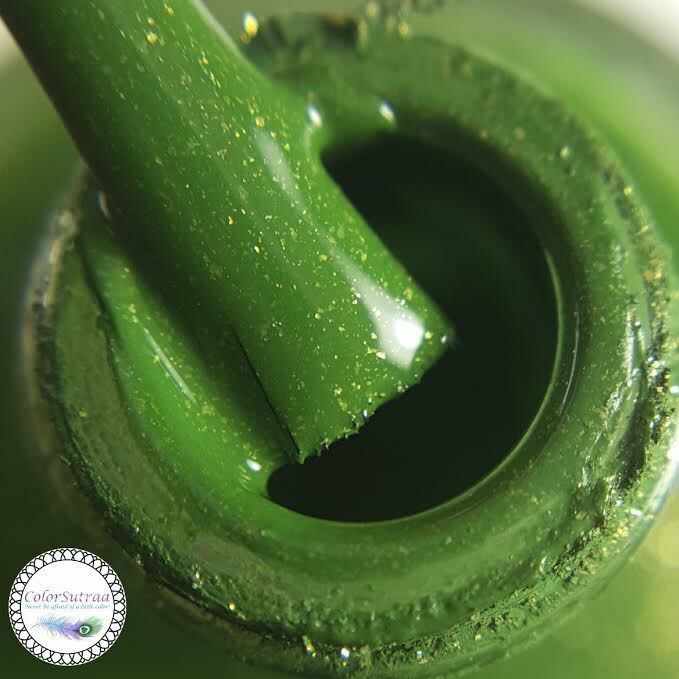 These balms can also be used on any dry areas for moisturization and protection, such as the cuticle area! Available in 5 flavors : Butterbeer, Mocha Latte, Creme de Menthe, Cherry and Raspberry. IMPRESSIONS : Yes, this is a SOFT lip balm indeed and if you're like me and used to Burt's Bees and firmer lip balms, this may come as a bit of a surprise but go with it--you may really enjoy it, just like I did. I stick mine in the fridge every once in awhile and pull it out to use at night. You kinda do have to go over it a couple of times with your finger but it feels really good! My Creme de Menthe is lightly flavored and peppermint-y--very refreshing! 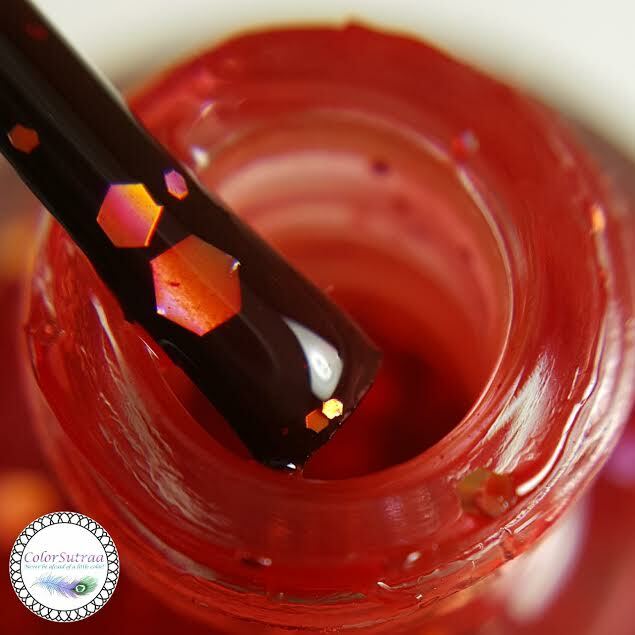 MK XLII is described as a "deep red jelly polish filled with multiple sizes of gold holographic hex glitters." Formula and application was just perfect--squishy jelly goodness. 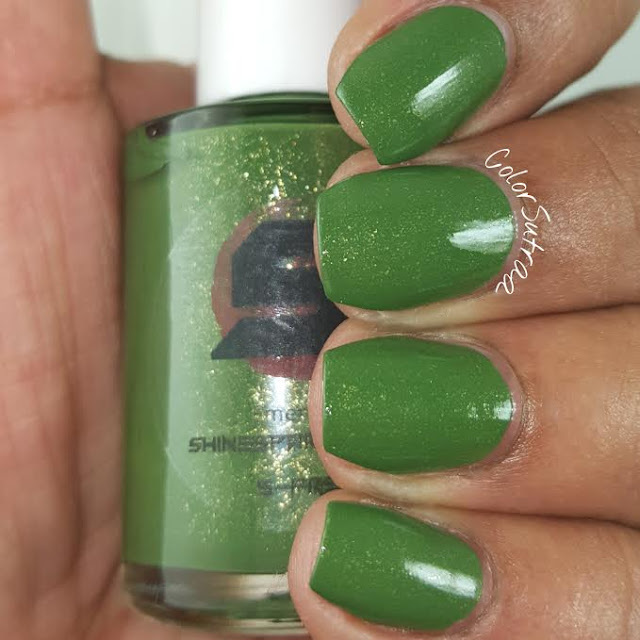 The swatches below show 3 coats by itself on the index and pinkie fingers and 2 thin coats over Zoya Janel on the middle and ring fingers, all topped with 1 generous coat of Glisten & Glow's HK Girl topcoat to bring it all together. Such a gorgeous red jelly! 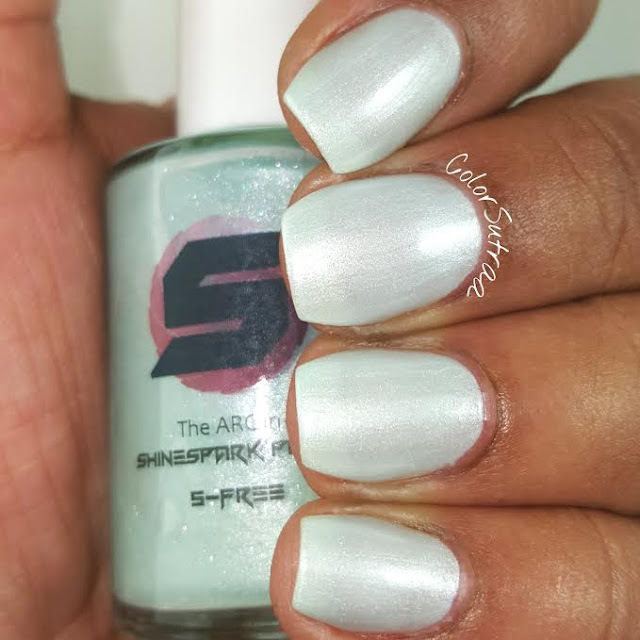 The ARC in me is described as a "a pale blue-green (almost seafoam-y) pearlescent polish that glows blue-green in the dark." Frosty shades like this can be a pain in the behind but this one applied beautifully-- I was REALLY impressed! 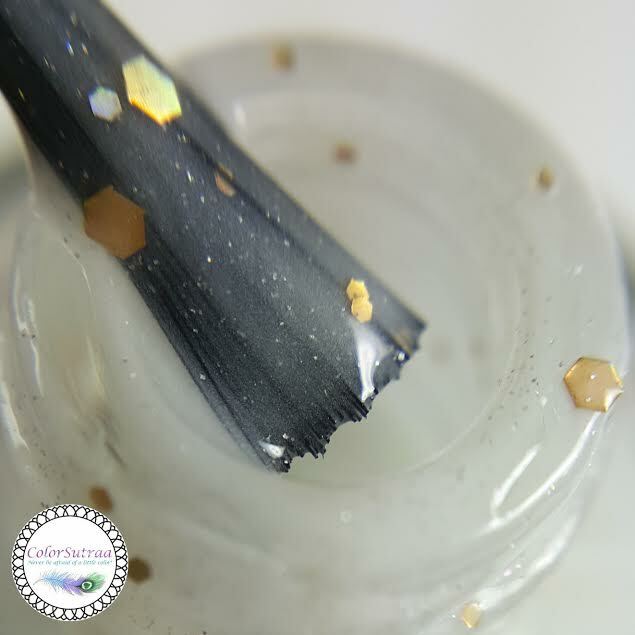 The swatches below show 3 thin coats, topped with 1 thin coat of Glisten & Glow's HK Girl topcoat. And just wait til you see what it can do! 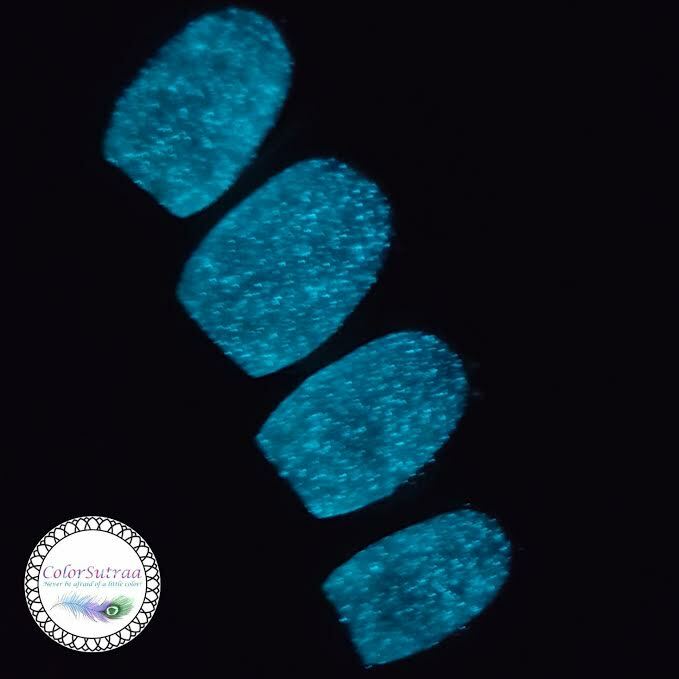 With a UV light nearby! 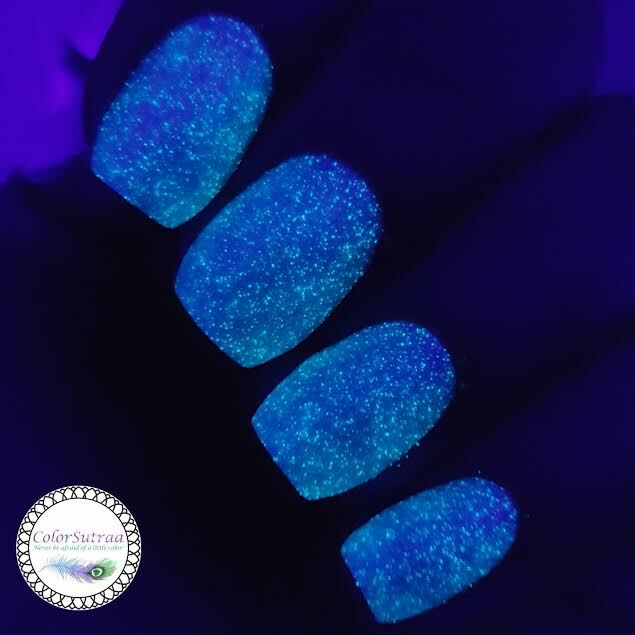 ...and Glow in the Dark! YAY! So there you have it, my darlings! 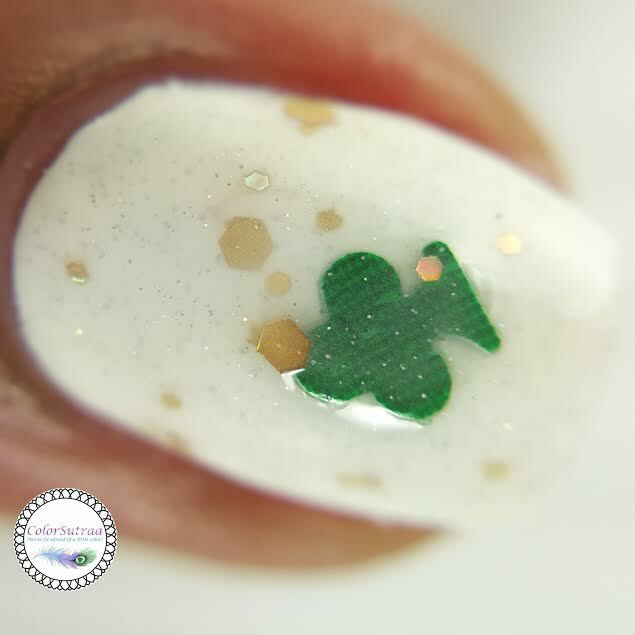 The St. Patrick's Day duo will be launching tomorrow, February 27th at Shinespark Polish's site HERE. The Iron Man duo and her bath and body products are still readily available. Please remember to follow Shinespark Polish on FACEBOOK and INSTAGRAM for all the latest news and updates, including exact times of the launch. What are you most excited about from this brand? Will you be grabbing anything? I'd love to hear from you in the comments section below! 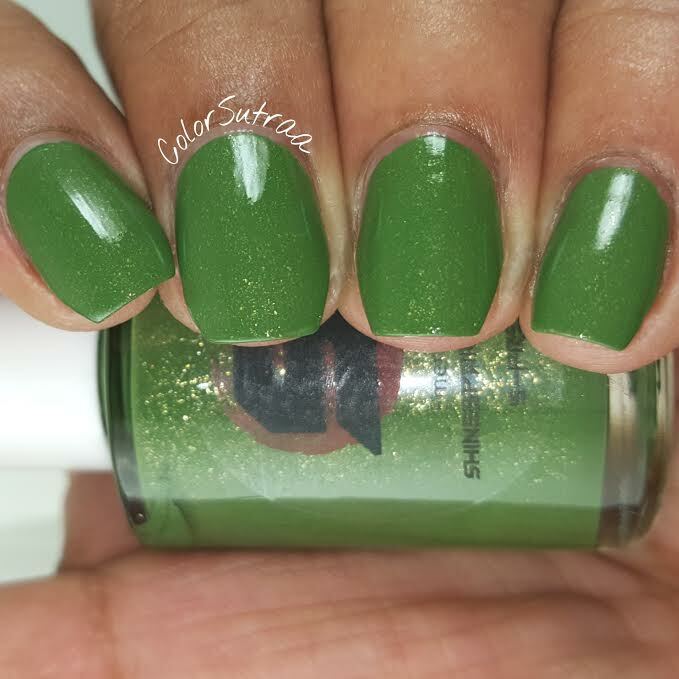 Emerald isle is gorgeous, and I don't usually like green polish lol.